Towards a predictive theory of galaxy formation. Simulating cosmological volumes with unprecedented physical fidelity. Recovering the diversity of galaxy morphologies. The Illustris project is a large cosmological simulation of galaxy formation, completed in late 2013, using a state of the art numerical code and a comprehensive physical model. Building on several years of effort by members of the collaboration, the Illustris simulation represents an unprecedented combination of high resolution, total volume, and physical fidelity. The About page contains detailed descriptions of the project, for both the general public and researchers in the field. On this website we present the scientific motivation behind the project, a list of the collaboration members, key results and references, movies and images created from the simulation data, information on public data access, and tools for interactive data exploration. The short video below is a compilation made from some of the movies available on the Media page, where many additional visualizations are available. We are happy to announce that the first two simulations of the new IllustrisTNG Project, the followup of Illustris, are now introduced! Many new supplementary data catalogs have been released over the past several months, including information on: galaxy matching between FP and DMO runs, non-parametric stellar morphologies at z>0, SMBH mergers, stellar assembly (in situ vs. ex situ growth, major/minor merger statistics), strong lensing, and halo/galaxy angular momentum. The Barabási group at Northeastern explores the graph-theoretic topology of Illustris galaxies in the Cosmic Web Network project. Illustris galaxies can now be visually classified as part of the Galaxy Zoo project. The Illustris Public Data Release. Illustris included in Physics Database's Top Physics News of 2014 as the May entry. The first data products are released (synthetic galaxy images at z=0), and user registration has been enabled. 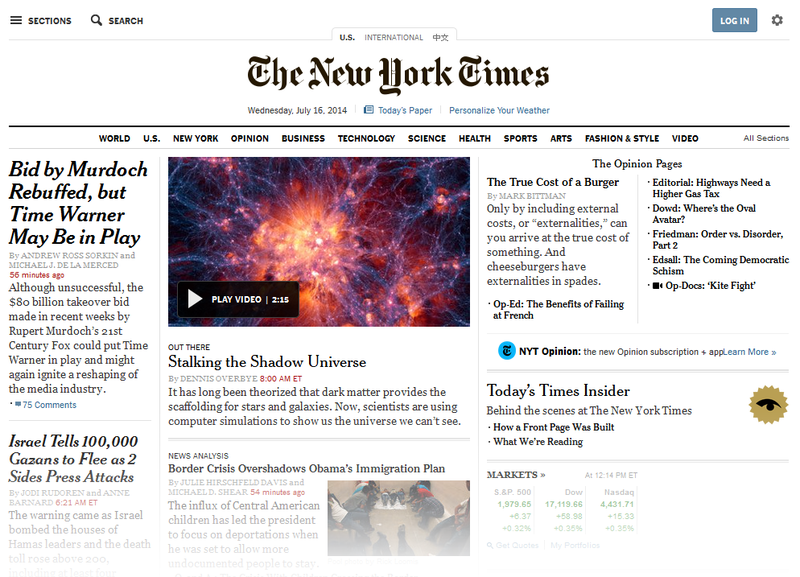 Featured on the front page of the New York Times (see Press Page for story and video). The timeframe for the full public data release of Illustris has been set as Q1 2015. The third (and final) introductory paper for Illustris, Genel et al. (2014), is now available under Results. The second introductory paper, Vogelsberger et al (2014b), is now available. Illustris article in Nature published, and the Illustris website is launched. Large run finished on SuperMUC/CURIE.